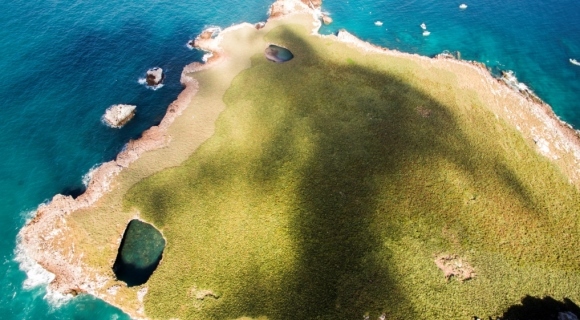 We’re going to take you on an excursion from south to north for a look at these gorgeous natural attractions: Islas Marietas, Isla del Coral, Isla Isabel and Isla de Mexcaltitlán. This is a Nature Preserve that has become an icon of the Riviera Nayarit. The group is made up of Isla Larga and Isla Redonda, both of which are located across from the coastline of Banderas Bay just 8 km (5 miles) from Punta de Mita. We recommend snorkeling, Stand Up Paddling (SUP) or kayaking—expect to see blue-footed boobies, humpback whales (in season), dolphins and many other species! This little island is just 3 km (2 miles) from the beach at Guayabitos in Compostela and is home to thousands of colorful fish and coral reefs—perfect for scuba diving. There are also pelicans, seagulls, boobies and more for you to enjoy from under your umbrella on the beach. This is a Nature Preserve that allows camping, 74 km (46 miles) from the docks at San Blas. The air is filled with frigate birds, but you’ll also find blue-footed and brown boobies. It’s the perfect place for fishing, scuba diving and hiking. Its beaches, the lighthouse, the Monas islets and the long crater are all part of the grand tour. The Islas Marías are 60 km (37 miles) farther in. This inhabited island is considered the birthplace of Mexican heritage. Don’t miss a stop at the local museum, El Origen, for a look back at its ancient history. Its restaurants are delicious: ask for the pescado zarandeado (wood-grilled fish) and the taxtihuil de camarón (shrimp in spicy broth). To get there just drive 34 km (21 miles) northeast from Santiago Ixcuintla to the La Batanga pier, where you can board a motorboat for the 15-minute ride to the island. If you head north you’ll arrive at Novillero, the longest virgin beach in all of Mexico, located in the municipality of Tecuala.